Give your instrument a 35db of non-distorted gain. This newer Fulltone FatBoost 3 FB-3 Guitar Effects Pedal is found in Josh Homme's pedalboard #1, a part of his Queens of the Stone Age gear setup. The product website insists that Eric Johnson uses the Fatboost FB3 pedal. 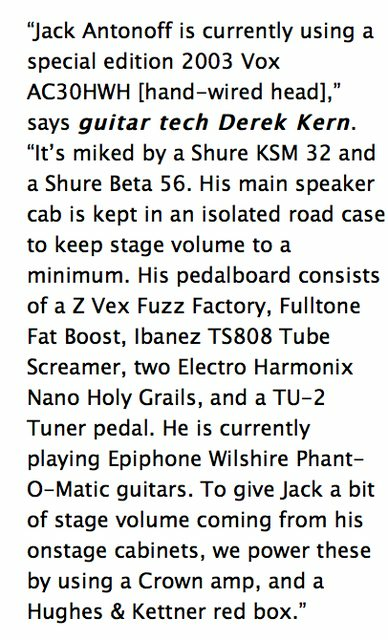 According to a Mix magazine article from October 2013, guitar tech Derek Kern says Antonoff uses a Fulltone Fat Boost on his pedalboard. The Fulltone website lists the FatBoost FB-3 as one of Stevens' pedals. Matt also uses this FB-3 as a clean boost! At 22:06 minute mark, Haefeli's pedalboard can be seen, with pedal next to EHX POG2 being the Fulltone FB-3 FatBoost pedal. This photo was taken on 2013 HEALTH concert in London. In this photo of Famiglietti with his pedalboard, one of the pedals in the pedalboard is the Fulltone FB-3 Fat Boost pedal. On the far right of this image, Lee's Fulltone FatBoost can be seen. The Fulltone FatBoost 3 is a discrete, Class-A, FET (Field-Effect-Transistor) guitar pedal offering up to 35dB of non-distorted gain without changing your signature sound, unless you want that. You can fatten/distort your tone, brighten or mellow up the sound, add or subtract bass, and even add harmonics. The FB-3 has true-bypass switching (via the Fulltone 3PDT) and incorporates a super-bright LED without the loud popping sound thanks to Fulltone's proprietary anti-pop circuitry. FET's can behave like tubes in a properly designed circuit. They can clip (distort) in a pleasing way instead of being buzzy or spiky-sounding (like a transistor) and can also add a subtle limiting to the signal which can even out the volume making your live and recorded tones more pleasing to the ear. If you're a recording engineer, you'll be happy to know you can use the Fulltone FatBoost 3 on everything from acoustic and electric guitar to electric bass, and even snare drums. The FatBoost 3 pedal works great in front of non-Master Volume tube amps to goose them into submission, as well as through Master Volume amps to drive them much harder than possible with just your guitar alone. It also works very well on bass, acoustic guitars (with pickups), and is ideal at the end of a pedal board effects chain to completely eliminate the tone loss caused by long guitar cable runs back to your amp. Doing so will allow the use of 50' (or longer) cable lengths with no signal degradation whatsoever. This version of the Fulltone FatBoost (FB-3) incorporates all of the things that people have loved about previous versions of these effects pedals in the past without any of the shortcomings. It brings back the 11-step FET Bias Drive knob that was missing from the FB-2. You'll notice that this knob makes a slight scraping noise when you turn it. Fear not, as that is totally normal, and is simply the sound of the Bias changing and settling on the FET MuAmp. The FatBoost 3 gives you the feeling that your amp is cranked at living room volumes so your playing is more dynamic and notes hold on longer without being distorted. It makes up for all the tone loss that (even true-bypass) pedals impart to your sound, especially if you have a lot of pedals on your pedal board.